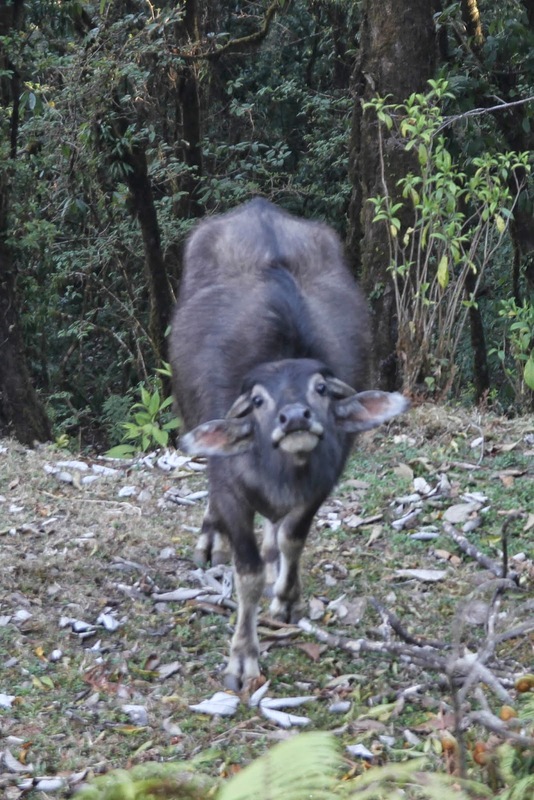 Trekking may have been the primary reason that I came to Nepal, but I honestly wasn't sure which trek I even wanted to try before I arrived! 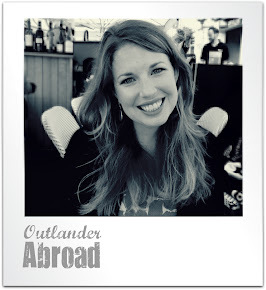 I had looked into a few options - the Annapurna Circuit, Everest Base Camp, etc. but I couldn't quite decide. 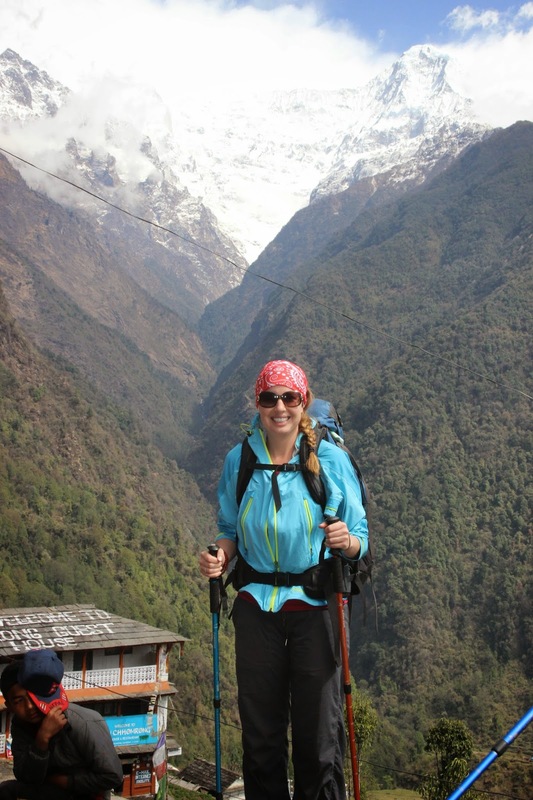 It didn't matter to me that I go to Everest Base Camp just to see Everest, and I had heard that Annapurna was a prettier trek in total. But the full circuit was intimidating to me - two weeks of walking, and once I pictured carrying gear for that amount of time (and not showering for that long), I wasn't thrilled. Besides, the two longest treks I had done up until that point were each only 4 days, and both of those treks were plenty long enough! 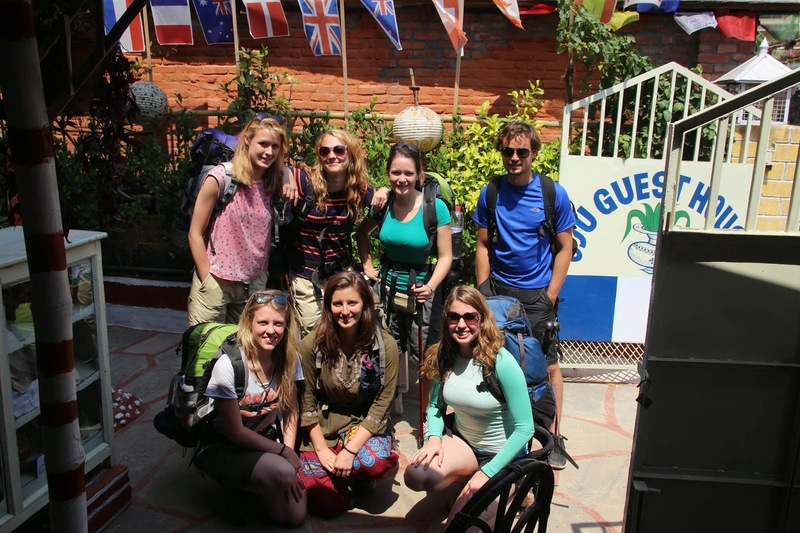 Fate intervened when I met a group at a neighboring guest house in Pokhara who were setting off to trek Annapurna Base Camp the following day. They were planning a 7-10 day outing, which seemed like just the right amount of time. Less than 24 hours later, my gear was fully packed and I was climbing into one of a pair of taxis that would take us to our starting point, along with three English medical students (Myriam, Ali, & Jo), a pair of siblings from England that had grown up in Kenya (Billy & Izzie), and an American who had just finished a stint as an English teacher in South Korea (Mel). Fresh and clean and ready to trek! 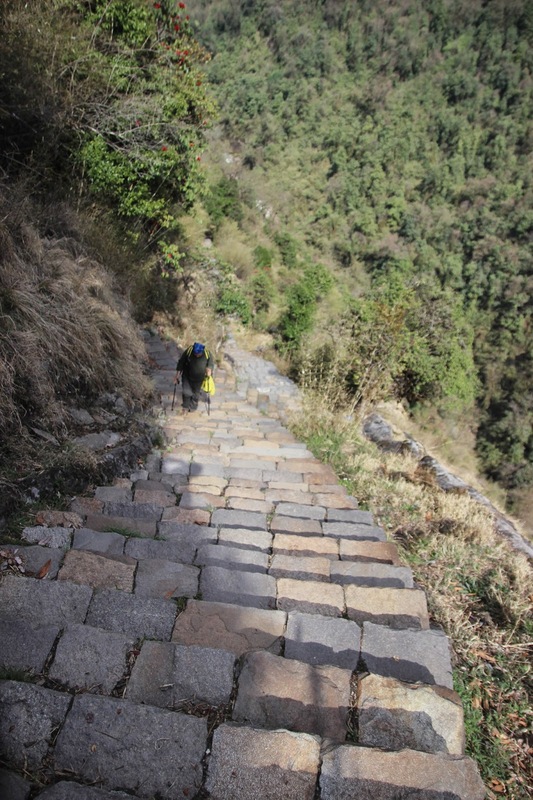 We started at Phedi, our very first task being to climb a set of very, very steep stairs under the hot midday sun. I immediately wondered what I had gotten myself into, and it was hard to imagine I would be needing all those warm layers stuffed into my pack! As we climbed, we were given an incredible view of the tiered hills. 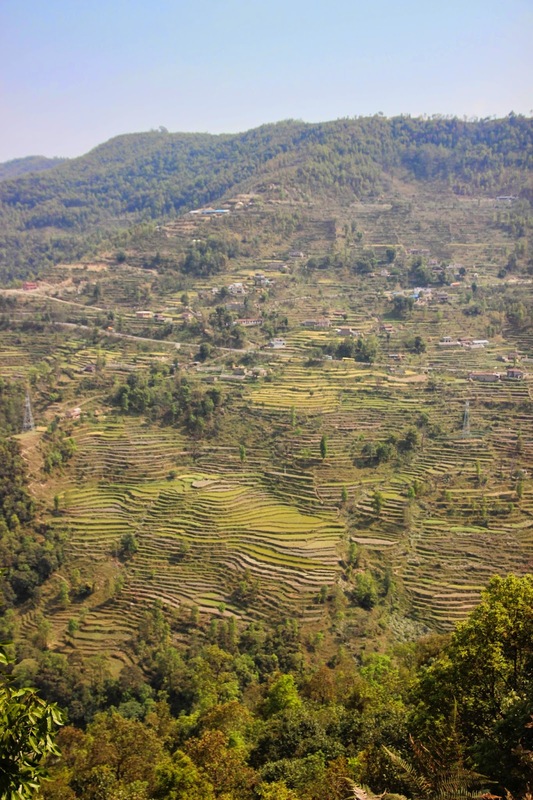 We were given brief respites from the stairs as we walked through tiny villages, crossing over carefully sectioned-off areas of farmland and passing livestock huddling in the shade under lean-tos. Tiered fields all along the mountain, the first beautiful view we were granted on the trail. We took a brief stop for in a slightly larger tiny village called Pothana, typical of what we would see later on the trail, really just a small collection of guesthouses with restaurants, where our permits were checked and our names registered. I was already wiped out by then (probably working out for the first time in weeks both of the previous days didn't help), but we continued on, climbing steady hills, passing an incredible view of snow-capped mountains in the distance, glowing pink from the setting sun. 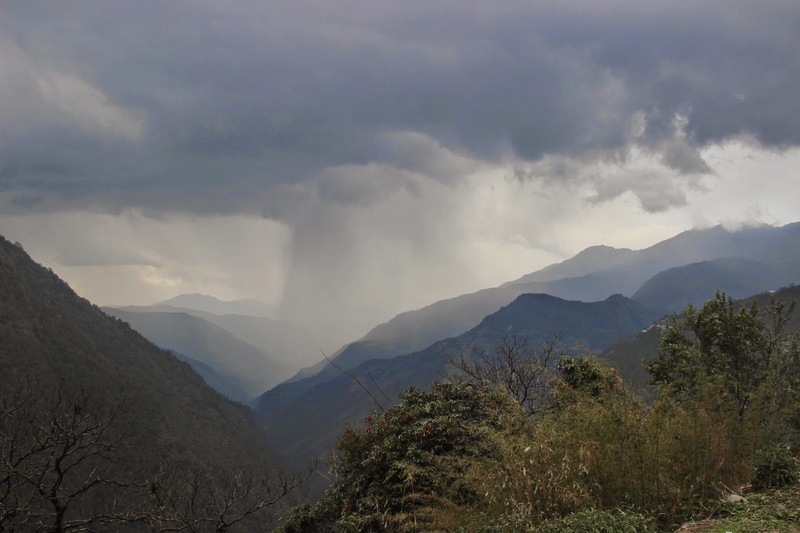 We had been hearing the rumble of thunder for well over an hour when we arrived at our destination for the night, Pitham Deurali. Luckily we had just gotten settled into our basic rooms when the rain arrived! 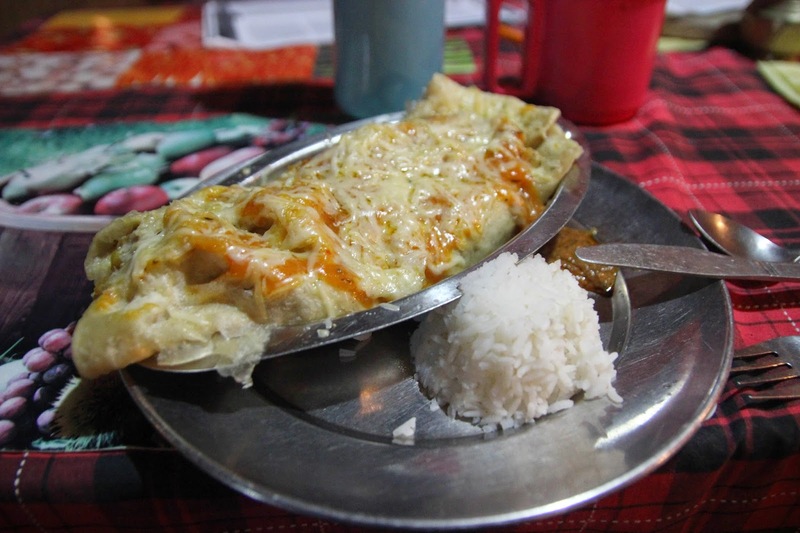 We huddled in the restaurant next door to our tiny, primitive guest house, enjoying the warmth of a small oven (by now it was definitely chilly), eating plates of noodles and fried rice, washing it down with refreshingly warm hot chocolate. Exhausted from just a few hours of hiking and anticipating an early wake up the following day, I was in bed by 8:30 that evening. We awoke just before sunrise, enjoying a gorgeous view of the snow-capped peaks in the distance being lit up by the ever growing red orb of the sun. We had a quick breakfast, then readied our gear and hit the trail, a party of 8 after picking up an English gal who was just wrapping up six months of extended travel (Khardine). The first leg of our day's journey was all downhill, and the portion to Tolka was incredibly steep! 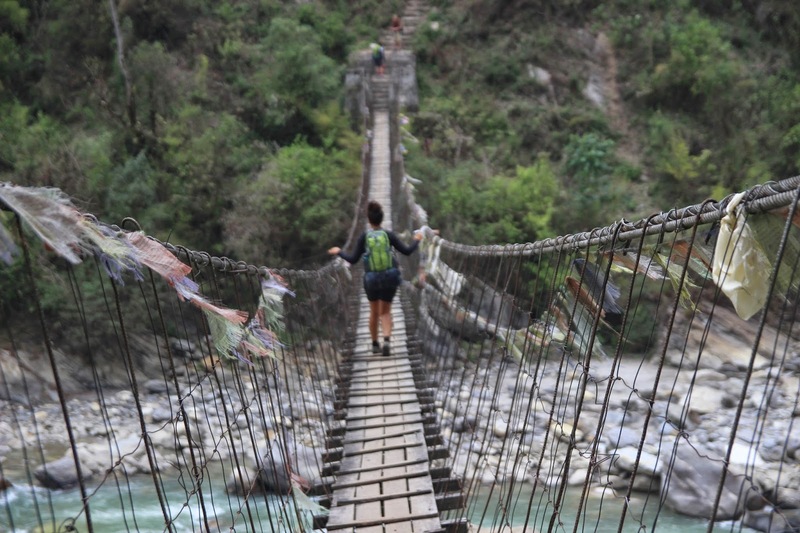 Ali running across one of the smaller suspension bridges we encountered. 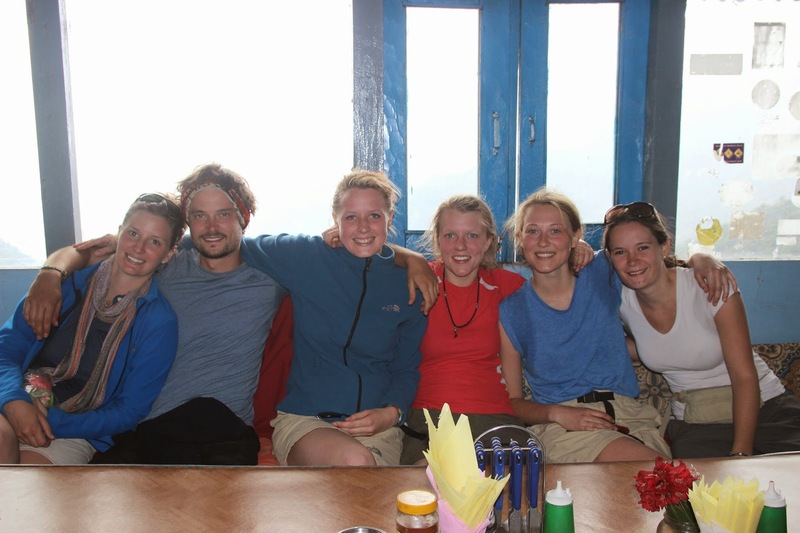 We took a brief stop for a snack break at Landruk, at a cliffside restaurant with an incredible panorama of the valley, tiered hills, the river below, and the mountains in the distance. Our path continued steadily downhill, taking us towards the river as we passed small waterfalls, lush greenery, and occasional tracts of farmland. 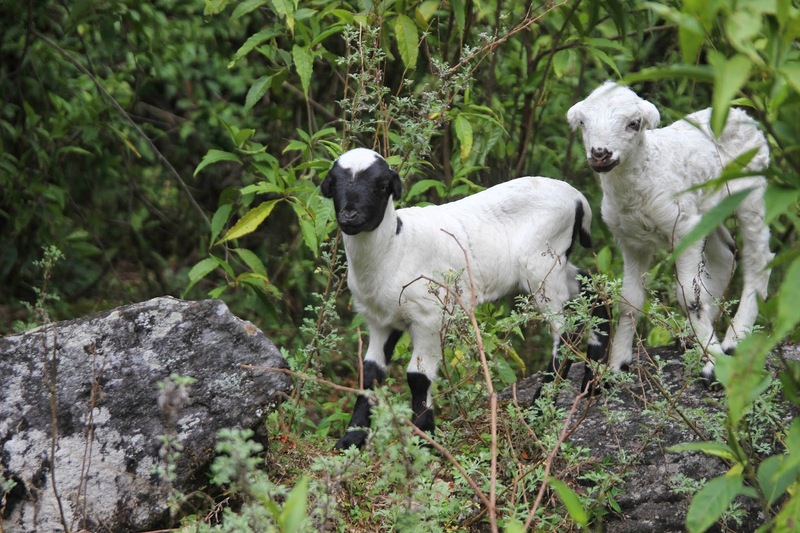 At one point we were followed by two adorable baby goats, bleating and frolicking away, until their owner ran up and scooped them up to carry them back! We stopped for lunch just prior to crossing the river - the area on both sides of the river is called New Bridge, but where we had stopped in particular was something like "New Bridge by the Waterfall". We settled in at a small spot with excellent fried rice as a light rain drizzled down, chatting with a pair of Aussies - Kevin & Tansy - that we would see a number of times again along the trail. Adorable kids who were running up and down the road in Landruk. 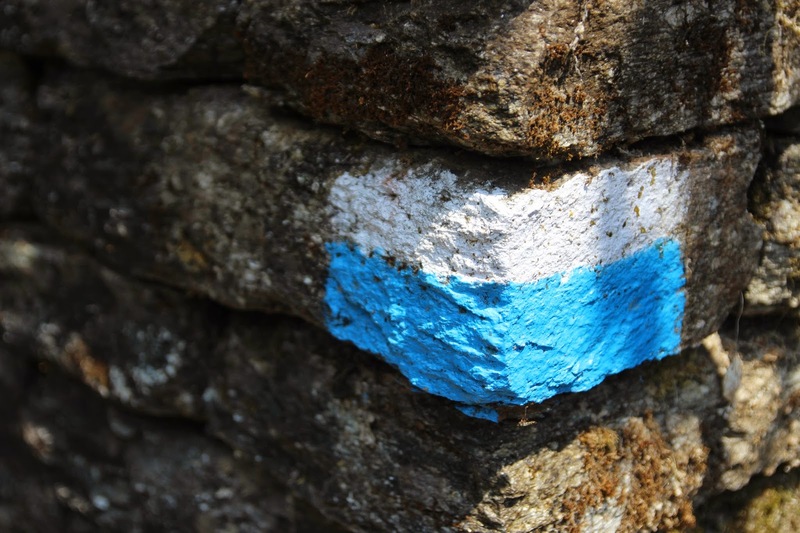 This white and blue blaze marked the trail to ABC. After lunch, we crossed the long suspension bridge over the river at our lowest point on the trail - from here we would have an incredibly difficult climb ahead of us! 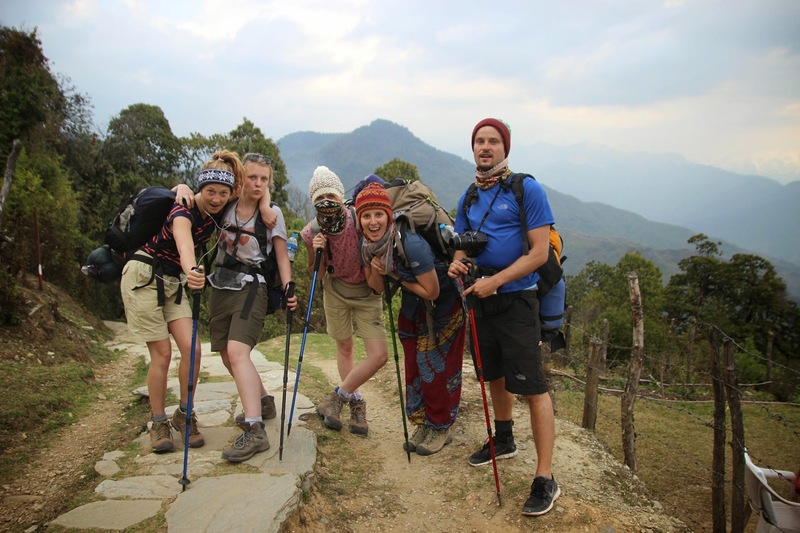 We started off with a more gradual uphill, crossing a gorgeous tiered farm and a small feeder stream before climbing a number of steep steps up to Jhinudanda. We had heard about a set of refreshing hot springs at Jhinudanda, but our large group was torn about how we wanted to proceed. The springs were supposedly about a 20 minute downhill from Jhinudanda, but we had planned on staying the night up at Chomrong, another two hours of the steepest stairs we would experience on the entire trek. It was also already fairly late, 4 pm, and we risked running out of daylight if we did go to the springs. In the end, Khardine and I continued on, and the rest of the group decided to visit the springs, planning to meet us in Chomrong that evening. 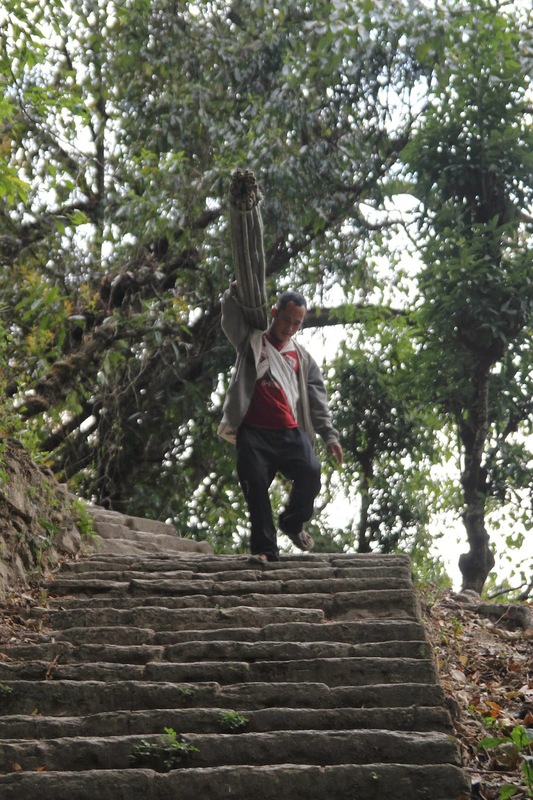 A man carries a large bundle of bamboo down a steep set of steps. The climb was indeed a challenge, a relentless series of stairs, made worse by a steady rain that began as soon as I set off. As if to increase the challenge even further, about halfway up it began to thunder loudly, and the rain turned to hail! Thankfully I passed a tiny settlement with a small shelter overlooking the valley, and I ducked in to grab a few moments peace and remove my pack as the worst of the hail absolutely hammered the tin roof over my head. Finally the hail cleared up, staying clear for the rest of my climb. 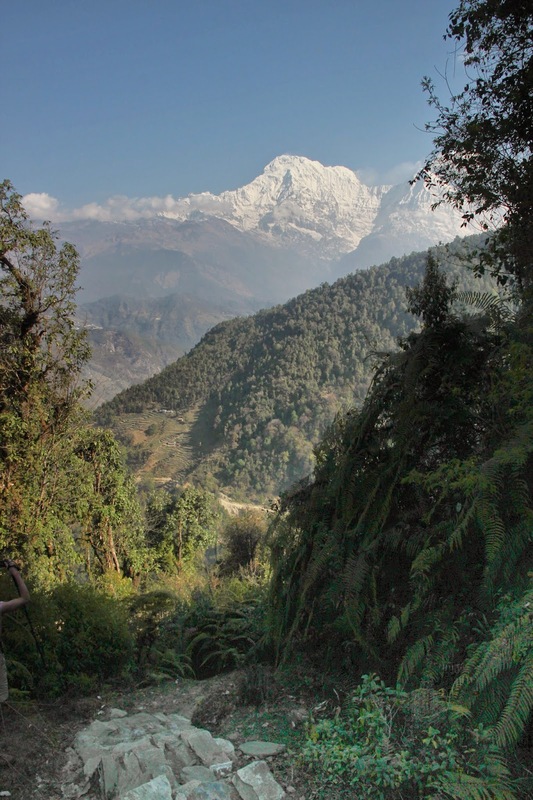 I was absolutely ecstatic when I reached the top, only to discover that I had to continue walking for another ten minutes or so to reach the place our friend Jack in Pokhara had recommended - Chommrong Cottage. Thankfully no more stairs were involved! Chommrong Cottage was absolutely worth making it to that evening - the kind owner actually let me borrow a small towel and a bar of soap, and I was able to take my only shower of the entire trek - and a steaming hot shower, at that. This lady was also famous for her restaurant menu (the menu is almost entirely consistent from location to location along the trail, with the blessed exception of this place), and she has even appeared in Time magazine for her chocolate cake! I saved the cake for later, absolutely stuffed after enjoying a massive bean and cheese burrito, flavored with ginger, garlic, and a special homemade sauce for a truly Nepali flavor. The rest of the group didn't wind up joining us, having spent too long enjoying the hot springs, but they planned on an early morning ascent of the stairs, hoping to meet us for breakfast at the Cottage. The absolute most delicious thing on the entire trail. Especially when paired with chocolate cake! The rest of the group didn't make it up to Chommrong Cottage until about 8:45 the next morning, making the long stair climb through a massive downpour. Khardine and I were pretty happy with our decision to have made the hike the previous night! Despite it being breakfast, the entire crew split bean and cheese burritos and chocolate cake to fuel up for the day, and finally around 10 am, we were ready to start walking. Thankfully the rain had finished up, and for better or for worse, the sun was shining. We started the day with a long descent - always a mental challenge when you know you'll have to make up that ground! - down to a suspension bridge over a stream, the massive mountains we were hiking towards fully visible in the distance. 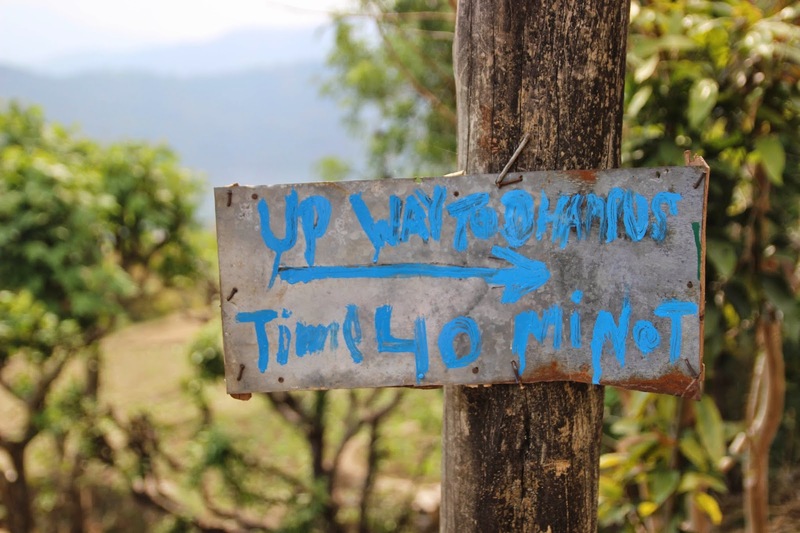 After crossing the river, we had to climb back up a series of stairs, passing "Lower Sinuwa", which consisted of a small restaurant, guest house, and couple of family homes, continuing our ascent until we reached Sinuwa. 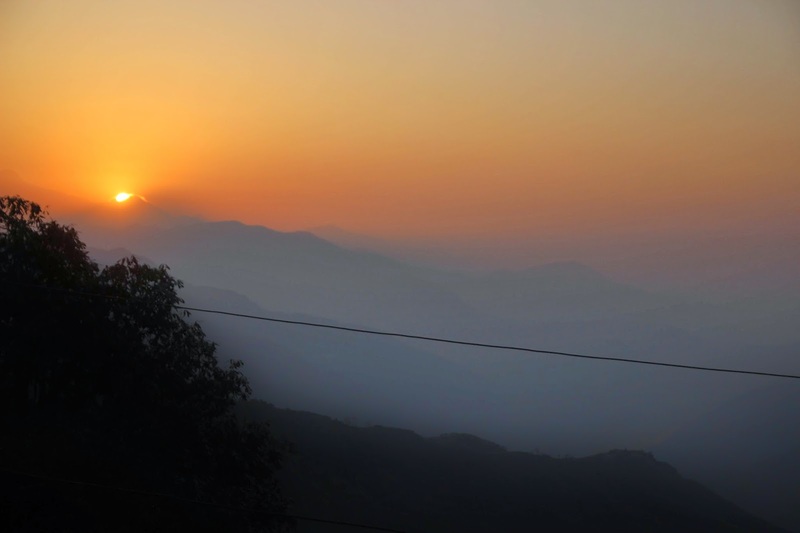 Starting the day from Chomrong. 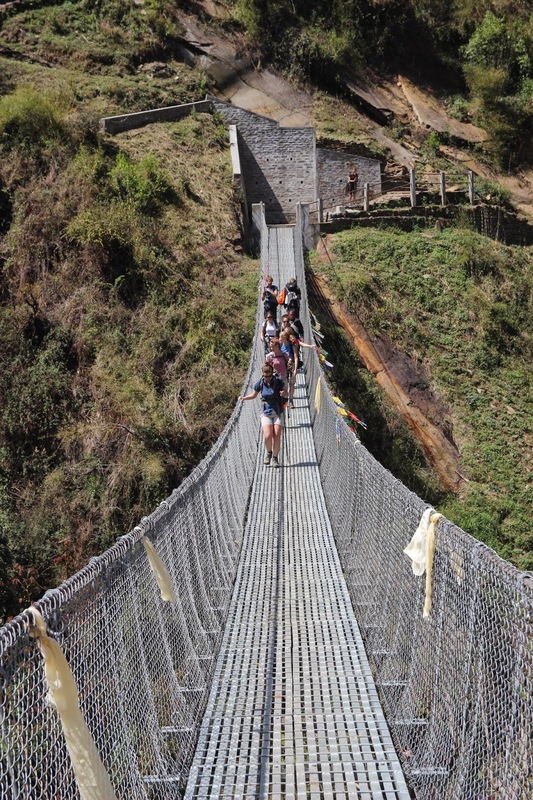 Another long suspension bridge just after Chomrong. We ducked into a restaurant with an incredible view of the valley below, just before another major downpour hit. In an attempt to wait out the rain, we cozied up inside, ordering a bit of food, which finally arrived once it was bright and sunny out. We hung around for a while, enough that by the time we departed, it looked like another storm was blowing in, but luckily we never got hit with much more than strong wind and a bit of light rain. A storm off in the distance - the rumble of thunder was a constant in the afternoons. 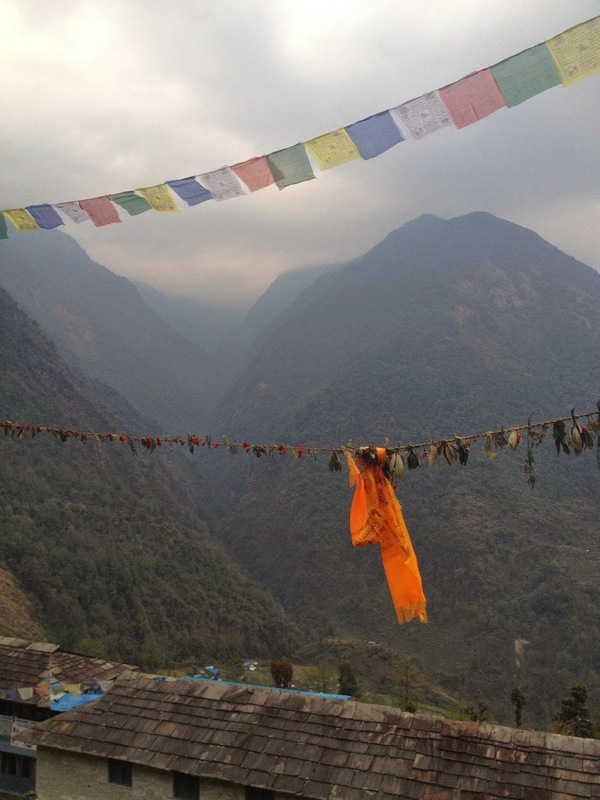 Prayer flags and lines of dried flowers are a common sight along the trail. The next section of the hike took us through lush forest - moss-covered old growth trees and ferns, less rock and more deep dark dirt path, wet from the recent rain, and occasional trees with bright red climbs of flowers. For the last section, we had a steep downhill, rock stairs taking us past an exposed section of the mountain with rocks and long grasses. Our final descent took us into the town of Bamboo, appropriately named as it sits in the midst of a deep bamboo forest. We didn't rest there for long, plunging into the forest, the path taking us through more moss-covered trees, stepping over massive root systems and moss-covered boulders, and passing huge clumps of bamboo. We took a short break to pose for silly photos along the way, in a sort of cavernous space within the trees, but still managed to make it to Dovan within an easy hour and a half. We stayed in the very first guesthouse, owned by a sister-in-law of the lady from Chommrong Cottage (everyone up there has some family connection!). Not having room readily available for all of us, they wound up creating a single, massive room for us under the dining hall, complete with eight twins beds squeezed into the space! The long descent into Bamboo. 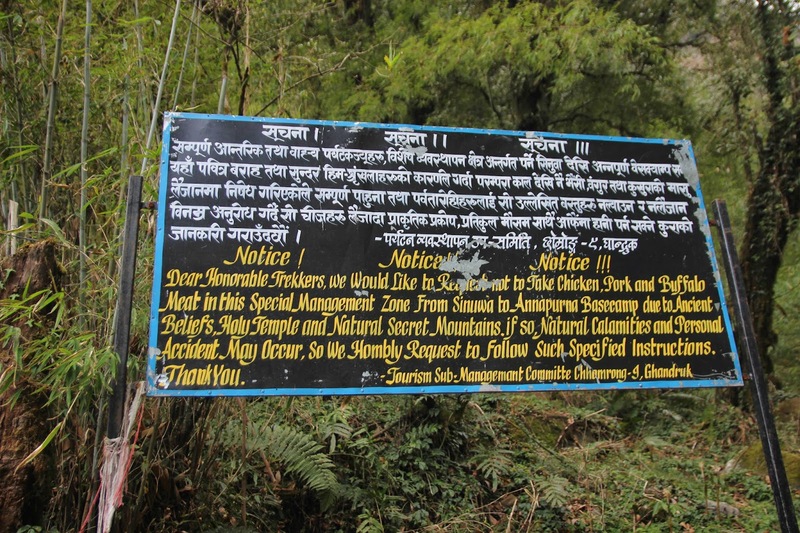 The villages further along the trail are strictly vegetarian, so hikers are asked to do the same. Our newly "constructed" eight-person room! 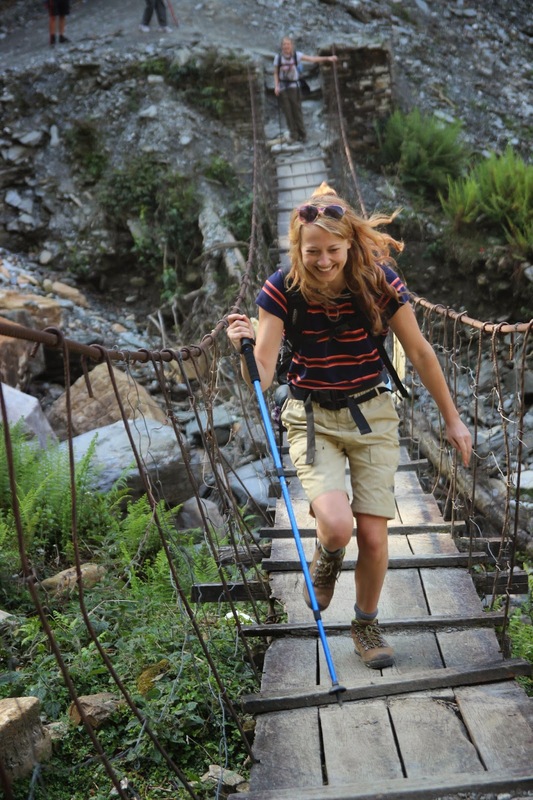 Next time: the rest of the trek, including an encounter with an avalanche, and reaching ABC. Thanks! It's definitely challenging, but you can also make it much easier on yourself by hiring a porter and/or just covering less ground per day. It was a great experience!